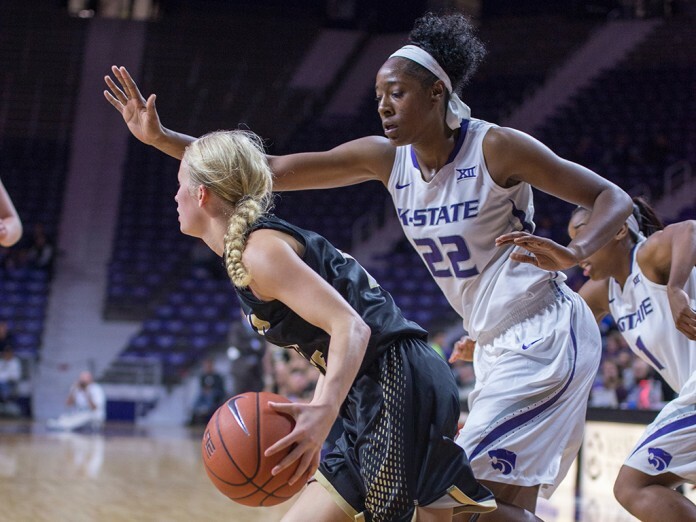 Last season, the K-State women’s basketball team saw their 12-year streak of Big 12 home opening-game wins come to a screeching halt with a 29-point thrashing at the hands of Baylor. 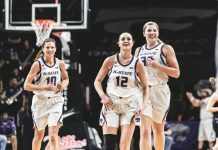 This year’s meeting at Bramlage Coliseum had a similar story line, as the Lady Wildcats were handed their worst loss since a 40-point debacle in Morgantown, West Virginia last season, losing 74-44 to the No. 5 Lady Bears. Baylor (13-1, 2-0 Big 12) seemed unstoppable in the opening half, running up a 31-17 lead, one that was insurmountable for the young Lady Wildcats (10-3, 0-2). In the second half, K-State mounted a run that had them within 16-points with over nine-minutes remaining in the game, but it was not enough to claw back against a powerhouse opponent. 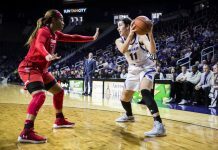 Even with forward Breanna Lewis (13) and senior guard Haley Texada (12) scoring in double digits, K-State couldn’t get enough offensive production to counter the potent offense of the Bears. The length of Baylor was a barrier that seemed to keep the Wildcats from going on any prolonged scoring-stretch. The Lady Bears — the best defensive rebounding team in the NCAA — had enough length to keep the Wildcats off of the glass throughout the game, out-rebounding the home team 46 to 25. The game’s turning point came early in the first half when Baylor freshman playmaker, guard Kristy Wallace, exploded off of the bench for 15 points in 17 first-half minutes. Wallace was almost-single handedly the executioner for the struggling K-State defense. While the Lady Wildcats had issues controlling Wallace early in the game around the perimeter, they began having issues controlling sophomore forward Nina Davis close to the basket late in the game. After holding their leading scorer to only four points in the opening half, Davis exploded in the second half with 20 points to help the Bears extend their lead. The first half started out in the best possible way for head coach Jeff Mittie’s Lady Wildcats. They were able to hold the Lady Bears to only two points for the first five minutes of the contest. Unfortunately for K-State, when Baylor knocked down their second shot, the points began to pour for the Lady Bears. For the next seven minutes, Baylor went on a 21-point run in which the Wildcats were unable to steal any momentum away from a Lady Bears team that had enough length to be able to consistently score in the paint. Baylor was able to consistently rotate the ball in order to give their stars enough space to knock down shots, including Wallace, who’s 15-points in the first half paced the team to a 36-17 lead and en route to the easy road victory. K-State will return to action Sunday against Kansas (9-5, 0-1 Big 12) in the season’s first edition of the Sunflower Showdown. Tipoff is set for 1 p.m. in Bramlage Coliseum. Bears junior guard Niya Johnson played a pivotal role in her team’s victory, being near the rare double-double without scoring, having nine-rebounds and assists. Baylor led for 34:44. The Lady Wildcats struggled at the free throw line, going nine for 21.